Ald. Ann Rainey (8th) listens at a city council meeting. Rainey pleaded with aldermen to permit the city manager to approve the construction contract for Howard Street Theater. City Council voted Monday to allow the city manager to approve the contract for the construction of the Howard Street Theater. Seven aldermen voted in favor of the contract, with Ald. Thomas Suffredin (6th) and Ald. Cicely Fleming (9th) voting against it. Ald. Ann Rainey (8th) said the project, which will be constructed in the 700 block of Howard Street, is the “jewel and crown” of her plans to revitalize Howard Street, which is in her ward. The project has been in the making since May 2015. In November 2015, the city entered into a memorandum of understanding with the Strawdog Theatre Company to occupy the space, according to city documents. After the company decided to discontinue its partnership with the city, Evanston city staff found a new tenant, Theo Ubique Cabaret Theatre. City staff worked with the company and Ross Barney Architects to plan the renovation of the building. They finalized plans in fall of 2017, according to city documents. The $1,385,469 contract with Structures Construction will receive its funding from the Capital Improvement Program and Howard and Ridge TIF funds, according to city documents. Fleming said she opposed the project because she feels the money could be better spent in other areas. “I have heard from constituents who are concerned about spending so I will not support it, not because I despise Howard or because I don’t want the theater company to do well,” Fleming said during the meeting. Rainey said the funds from the TIF can only be used between the 300 and 800 block of Howard Street, so it would not be possible to allocate the resources elsewhere. Other than the “usual criticism,” Rainey said constituents from her ward are “very supportive” of the theater. During public comment, Mike Vasilko suggested the council delay approval of the project until they receive more detailed information about the cost of construction. He said the low bid could signal hidden costs the city may have to pay for later. Rainey noted Structures Construction is also working on the Dempster Beach House. She said opposition to the company might stem from delays in the beach house’s construction, but she said the two projects present different challenges. 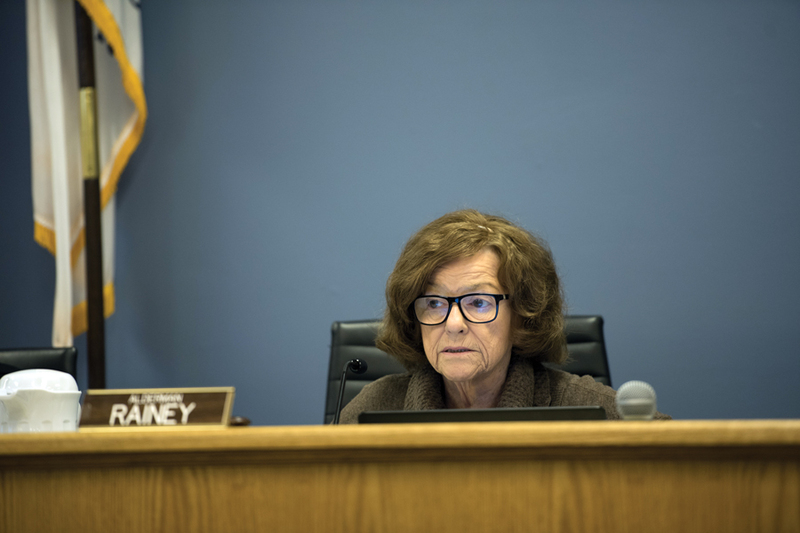 Rainey, who has spearheaded the Howard Street Theater project, urged her fellow council members to approve the construction contract.